Glucose tolerance test (GTT) is a test to measure your body’s response to sugar (glucose). GTT can be done by oral or injection. GGT test done by oral is known as oral glucose tolerance test (OGTT) whereas GTT done by injection known as IGGT. In Malaysia, OGTT is practiced. GTT test are used to identify pre-diabetes, diabetes and gestation diabetes patients. Patient should eat normal diet for three days before the test. Patient should fast 8-10 hours before test is conducted. Fasting blood sample will be taken. Patient will be given glucose water to drink within 5 minutes. Blood sample will be taken after 2 hours for glucose determination. Patient should rest throughout test with only plain water is allowed to drink. Test performed are fasting glucose and 2 hour glucose. Test can be done by using capillary sample or venous blood. Glucose determination using venous blood should be measured immediately after collection or plasma should be separated immediately. 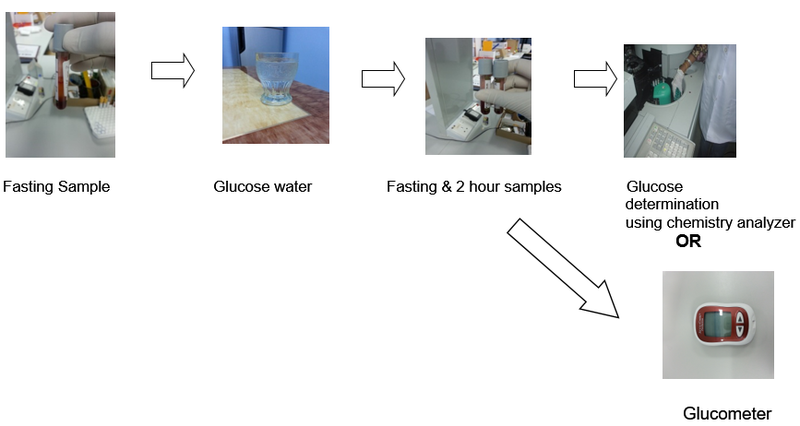 Sample for plasma glucose should be collected using container with glycolytic inhibitors. GTT can be useful tools to identify pre-diabetes patients and gestation diabetes patients. It can prevent progression to diabetes. It also can treat and prevent any complication during pregnancy and delivery. Marshall, W. J., & Bangert, S. K. (2008). Clinical Chemistry (6th). United Kingdom: Mosby Elsevier. Chandrasoma, P., & Taylor, C. R. (1995). Concise Pathology (3rd ed). Stamford: Appleton & Lange. Leeuwen, M.V., Leeuwan, M.D., Opmeer, B.C., Limpens, J., Serlie, M.J., Reitsma, j.b., et al. (2012). Glucose Challenge Test for Detecting Gestational Diabetes Mellitus: A Systemic Review. An International Journal of Obstetrics and Gynaecology,119, 393-401. Glucose Screening and Tolerance Tests During Pregnancy. Retrieved May 29, 2015, from http://www.nlm.nih.gov/medlineplus/ency/article/007562.htm. Glucose Tolerance Test Non-Pregnant. Retrieved May 29, 2015, from http://www.nlm.nih.gov/medlineplus/ency/article/003466.htm.